Security forces have been carrying out relentless operations in the run up to ULFA(I) Protest Day on 27 November. 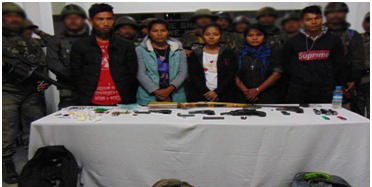 In two separate operations the Jairampur Battalion and Changlang Battalion of the Assam Rifles along with army apprehended five NDFB cadre and two OGWs of NSCN(R) on Thursday night in Arunachal. To maintain peace and tranquility in the region troops of security forces under the aegis of DAO Division have been carrying out relentless operations in the run up to ULFA(I) Protest Day on 27 November. Biswajit Basumatray alias B Birsha, Birkhang Basumatray alias B Bwsrang, Divika Muchhary alias M Daobaisuli, Sampa Basumatray alias Sarfao and Dwimu Brahma alias B Dwijiri of NDFB were apprehended from old Khamdo village, District Changlang by the Jairampur battalion while trying to infiltrate into Indian territory and escape to Upper Assam. Large number of arms and ammunition including four pistols and one carbine along with other incriminating evidence were recovered. In a similar operation launched by the Changlang Battalion two OGWs of NSCN(R) were apprehended from Ledo and Margherita, district Tinsukia. Acting on specific intelligence about presence of likely OGWs trying to terrorize and carryout extortion in Ledo and Margherita, Seraj Khan and Sibu Pradhan, OGW of NSCN(R) were apprehended. On questioning the duo confessed to carrying out extortion on behalf of NSCN(R) and acting as OGW for the group.